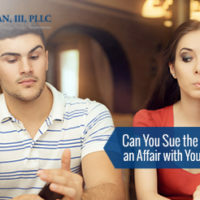 Can You Sue the Person Who Had an Affair with Your Former Spouse? A cheating spouse is one of the most common reasons for divorce in cases a Tampa divorce attorney handles. Other major grounds for marriage tension such as financial strain does not usually cause quite the same emotional trauma as an extramarital affair. Even when the couple survives infidelity, things are never quite the same between them. The broken trust will usually see the offended partner experience feelings of inadequacy, rejection and suspicion. The decision on whether the marriage will end or heal rests with the couple. However, an affair inadvertently injects a third person into the conversation. Let’s face it, the victim of cheating will have a strong desire for revenge. A lawsuit would seem to provide the perfect avenue to achieve that. Can one sue the ‘other woman’ or ‘other man’ who they believe led to the breakdown of their marriage? Suing the third party was traditionally done under the alienation of affection laws. The alienation of affection claim is based on the understanding that an external party has done something that harmed the marriage and perhaps led to its dissolution. While this law was available in Tampa in years past, it no longer is. In fact, countrywide, just 5 states still allow alienation of affection suits. There is a strong likelihood that this number will only continue to decline. Adultery and divorce have become much more frequent than in decades’ past. Many states therefore considered the alienation of affection charge cumbersome and difficult to prove. It was abolished as impractical. The law in Tampa however allows either party to the divorce to bring up the adultery during the proceedings as means of influencing judgement on the amount of alimony due. You’ll probably want to sue the paramour if your spouse used marital funds to finance the relationship. For instance, if your partner transferred family assets to their lover or gave them cash from your life savings kitty, suing the third party is worth exploring. You would be entitled to half of any marital assets that were transferred without your consent. The suit would also come in handy if the transfers are ongoing. The court can order a freeze on all transfers to allow for the hearing and determination of the case. Each case is different though and you would probably want to find out from your Tampa divorce attorney whether this is a feasible option in your circumstances. Overall, any kind of lawsuit against the third party in an affair is extremely rare in Florida. A seasoned Tampa divorce attorney will often advise persons whose marriages have been ruined by adultery to focus their energies on the divorce case. This is where they can get their ‘revenge’ by getting their fair share in the division of marital assets and pursuing child custody. At Blair H. Chan III PLLC, we know how important it is to keep your eye on the ball during the emotional turmoil. Contact us today and one our attorneys will help you pursue the appropriate path.